Heat oven to 350°F (325°F for dark or nonstick pan). Line 9-inch square pan with foil, allowing some to hang over edges of pan. Grease bottom and sides of foil with shortening or cooking spray. Make and bake brownies as directed on box. Top hot brownies evenly with peanut butter cup candies, 4 rows by 4 rows; press down slightly. Cool completely on cooling rack, about 1 1/2 hours. If necessary, refrigerate 30 minutes, until peanut butter cups are firm. In large bowl, beat butter, peanut butter, powdered sugar, milk and vanilla with electric mixer on medium speed until smooth and creamy. Spread evenly over brownies. 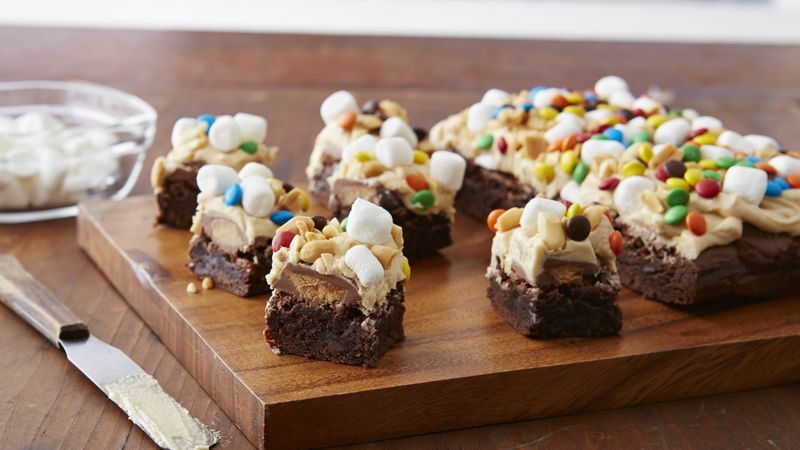 Top with marshmallows, peanuts and chocolate candies; press down slightly. Refrigerate 30 minutes. Using foil to lift, remove brownies from pan, and peel away foil. Cut into 4 rows by 4 rows. Cover and refrigerate any remaining brownies. Wrap individual brownies in food-quality Halloween-colored plastic wrap. Serve these decadent brownies with glasses of cold milk or apple cider.